Mobile Development is rapidly gaining in popularity in the academic world. Considering that there are a high number of mobile users, the increased interest in mobile development in the IT field is quite understandable. However the academic records have a different story to tell. The mobile apps development boom has also influenced other academic fields like the sales sector, marketing department, etc. More number of professors are making sure that mobile development skills are imparted to the students in their respective fields. Number of mobile users worldwide in 2007 was 400 Million and desktop users was 1100 Million. Number of mobile users worldwide in 2015 is 1900 Million and desktop users is 1700 Million. Average time spent on a mobile device in 2008 was 12% while that on a computer was 80% of total time spend on a devices in a day. The average time spend on mobile device in 2015 is 51% while that on a computer is 42% of total time spent on devices. The number of mobile internet users in 2010 were 13.98 million. The number of mobile internet users in 2015 so far is 788.32 million. Encourages rapid application development by using such principles. Very little coding is required. Supports several database platforms like Oracle, SQL Server, MySQL, SAP, SharePoint, and LDAP besides several others. Ability to develop highly scalable apps. Instant deployment of app on a public or private cloud. The drag and drop interface provided make it very easy and speeds up the development process. It is not necessary to maintain multiple codebase for several platforms like iOS, Android, Windows Phone, etc and more. Appery has ability to utilize a single codebase. Appery is very robust an up to date at the core by using jQuery Mobile, ionic and AngularJS for mobile web apps. Has an amazing ability to integrate seamlessly with third party APIs and hence it is the perfect environment for professors. For the more IT inclined people it is also possible to add custom code to explore the advanced features and develop more feature rich applications. 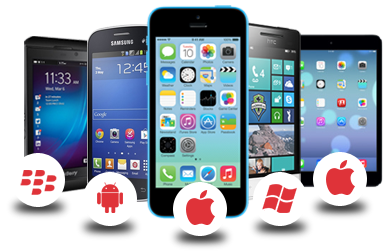 Alakmalak is a leading mobile app development company in India and have been for a while. They are one of the few web development firms in the country which have completed more than 2000 successful projects in their first 10 years. Besides being a mobile app development company they offer several other services like web development, digital marketing and hence are never short of any resources to complete the project.